This apartment is at ground floor and we can make this apartment in communication with the first-floor apartment for a total of 8 +2 beds in the villa. Holiday Apartment offers two flats inside an old barn that were recently restructured. Both the apartments can accommodate up to 4 people and are composed of a bedroom with bathroom, a small bedroom and a dining room/kitchen area. Outside the flats there is a large garden with car park at guests' disposal. Is available a new swimming pool 8x4m. Near to the barn there is also a little lake where is possible fishing and a green zone where graze 3 beautiful donkeys. The apartment is built in Tuscan style with hand-made bricks in the floor and antique furniture of the period. We loved every minute staying here. Leandro and all his extended family are so kind and helpful. We are a family of 4, and having the 2nd bedroom and 2nd full bathroom really made our stay more comfortable (compared to the small hotels we had been staying in). The kitchen has everything you need to make a meal and feel like home. The location was perfect for us, since we wanted to travel by car to most of the Tuscan area. Siena is only 30 min max, and the ocean/Pisa is 90 min. The pool was used by our daughter, a bit too cold for us, and the surrounding grounds are beautiful and great for relaxing when we were not out travelling. The donkeys were an added bonus, love how they call you when we would arrive home for attention and some food. Thanks again Leandro for our stay, we plan on returning and have sent your link to all our friends. Cheers. Thank you very much for your wonderful review we were very happy to have you hosted, I hope to meet you again. Greetings from all of us, Leandro. Fantastic property in a great location! Beautiful property in idilic location. Just be prepared for the mosquitos. Leandro and his family were brilliant hosts and made sure we had a perfect holiday. Thanks for letting us share your little piece of paradise. Thank you very much for your courteousness, kindness, we enjoy to host you, I hope to meet you again, regards, Leandro. What a lovely place and holiday this turned out to be right from the moment we arrived. Leanadro ( and all the family) were lovely. 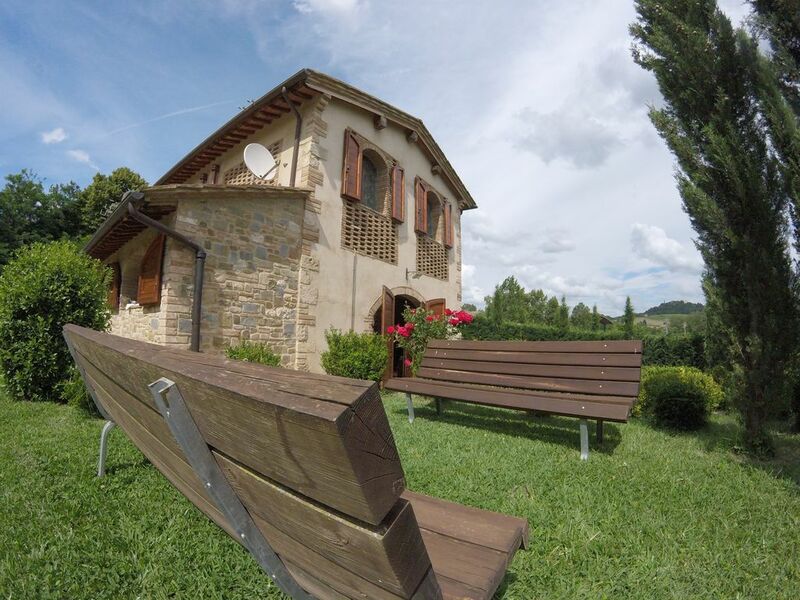 The house is a delightful rustic property and a lovely location with a fabulous swimming pool with everything needed for a relaxing Italian holiday. The village of Ulignano is close to all the major tourist locations and if you need to go to the beach there is one out on the west coast at Rosignano (1.5 hours away) which looks just like those in the Caribbean. Our weather was hot and sunny and the pool was fantastic to use, with good quality sunbeds and decking. The village of Ulignano has a bakery and a bar, San Gimignano is 7 k's away and check out 'The Bird' restaurant at Vico d'Elsa 2.5 k's away serves fresh local produce, is good value and has stunning views-also the chef/owner is an engaging character. There is a good supermarket (PAM) in Poggibonsi and every Tuesday night in summer all the locals in nearby Certaldo hit the main street for the evening promenade social get together- great atmosphere! The whole holiday was a relaxing treat! Fantastic stay! Fantastic for families with children. We have just thoroughly enjoyed a couple of weeks in this amazing Tuscan apartment. It is surrounded by beautiful green hills, the view is delightful. The lake (and fishing equipment) was used everyday by our two young sons who caught fish and lizards all day, everyday. We enjoyed feeding the donkeys and watching nature at its best. The apartment was very well equipped with nice and comfortable furniture. The kitchen made preparing meals very easy. The hosts were always around and incredibly helpful and friendly. Our children will be very sad to say goodbye. Although the weather was still a bit cold we enjoyed swimming in the brand new pool. The location made getting to San Gimignano, Siena, Florence, Volterra, Certaldo Alto and other lovely Tuscan villages very easy. A bit of heaven in Tuscany! My husband and I stayed at this property, Salvia, with another couple, for 5 nights. The property is located within 10 km of San Gimignano and is easy to travel to Volterra and Siena. I recommend arriving during the daylight, as it is difficult to find the first time. The apartment is spacious and has a large refrigerator and enough cooking pans and utensils for cooking your own meals if you would like. There is a large supermarket in Poggibonsi, not far away. You do need to have a car in order to stay here. There is an outdoor eating area and a pond that has carp fishing available. There is a gated entrance and it is quite safe. There are two bedrooms and two baths, which makes it nice if you are sharing with another couple. Leandro stocks it with wine, which he charges 4 Euros per bottle. The internet worked reasonably well and the outlets were sufficient for all of the electronics we brought with us. There is a washing machine and a hangar device for drying. This is a family affair and Leandro's father greeted us when we arrived and his father-in-law was there when we left. We had an excellent stay here and highly recommend it. We would definitely stay here again. Very reasonable prices. This is a lovely and very large apartment. We stayed with a friend, and we each enjoyed a beautiful and large room with our own private bath. We took advantage of the nicely equipped kitchen to prepare breakfast and several dinners; there's a nice supermarket in nearby Poggibonsi. We were on the lower of the two floors, but, since the floor of the upper unit is cement, there is no noise to worry about. Our host Leandro was very welcoming, and everything was beautifully prepared for our arrival. Location is very near San Gimignano, and this is a good base for exploring Siena, Volterra, and the other towns of Tuscany. An excellent value, and a great place to stay. Holiday Apartment is situated in the middle of Tuscany, 8km far from San Gimignano, 30km far from Siena and 40km far from Florence. This farm is close to an abbandoned old paper-mill built on an ancient mill erected by friars of San Galgano. Available maps in gpx and kml format for walking and cycling.